Our reserves of helium are finite and we’re running out. This may come as a mild disappointment to children everywhere but its really bad news for science. My (and everyone else’s) NMR machines use liquid helium (at 3 Kelvin) as the coolant for their superconducting magnets. The same goes for MRI scanners and those cathedrals of science the particle accelerators like the LHC. And right now there’s a world wide shortage of helium which means that we may have to decommission some of our NMRs. Re-commissioning them will then cost 10s of thousands of dollars, plus it would require huge amounts of liquid helium to cool them down again. We fill these instruments with liquid helium regularly, replacing the stuff that’s boiled off. The thing is that once that helium has evaporated off and into the atmosphere its gone. There’s no getting is back. So why don’t we bother collecting the boiled off helium? All we’d need to do is stick a balloon on top of the NMR machine, then a simple compressor could be used to turn it back into a liquid. We don’t bother with this simple bit of recycling because there’s no immediate economic imperative. 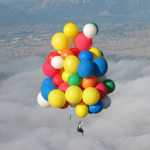 But hang on, didn’t I just say the reserves are limited, so surely helium is really expensive? Well it aught to be. 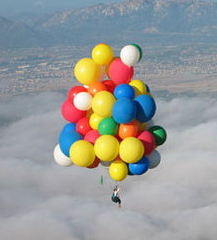 According to Professor Robert Richardson, who won the Nobel physic prize in 1996 for his research on helium, a helium party balloon should cost $100. Instead they cost about 50 cents. The reason helium is sold well below its ‘real’ value is because of an odd law passed by the US congress in the 1996. Robin McKie explained some background in The Observer newspaper last month. In the 1920s the US decided helium would be a strategic resource. It realised that air power would be crucial in future wars, and assumed that these would be fought by airships that would use helium to float. Then to cut costs in 1996 Congress passed a law mandating the U.S. helium reserve (the largest in the world by some way) be sold off by 2015, irrespective of market price. They set in stone the amount of helium that needed to be sold and so ever since they have been dumping it on the market. This is a long term issue, but it doesn’t explain the immediate shortage. The problem here, as far as I can gather because our suppliers (BOC) aren’t telling us much, is that several of the worlds helium refineries are out of action. That, at least, was the case 10 months ago according to gasworld. And they don’t expect things to improve until a new plant comes on line in 2013. In the meantime it looks like there’s going to be a long queue for the remaining NMR machine. 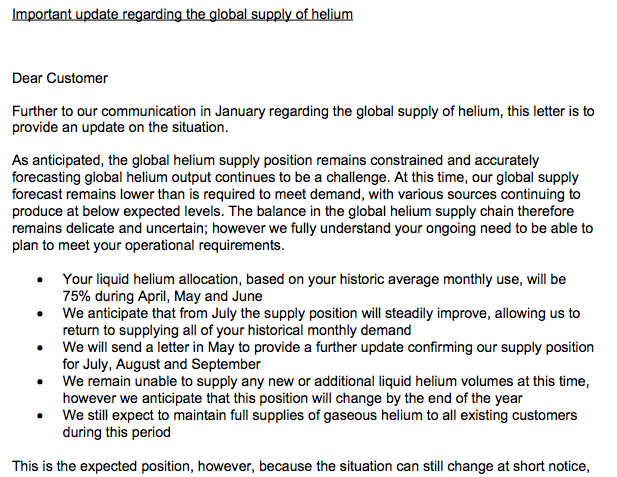 Here’s the latest on the helium situation from BOC in the UK.